This article is for quizzes on Wednesday June 15th..
John Stith Pemberton (July 8, 1831 – August 16, 1888) was an American pharmacist, and is best known for being the inventor of Coca-Cola. In April 1865, while serving as a lieutenant colonel of the Confederate Army's Third Georgia Cavalry Battalion, Georgia State Guard, Pemberton was wounded in the Battle of Columbus, Georgia. He sustained his injury from a saber with which he was slashed across his chest, and like many wounded veterans of many wars, he became addicted to the morphine used to ease the pain. As the pharmacist that he was in civilian life, Pemberton sought a cure for his addiction. In 1866, in Columbus, Georgia, he started working on painkillers that would serve as opium-free alternatives to morphine. His first was "Dr. Tuggle's Compound Syrup of Globe Flower (Cephalanthus occidentalis)". He next began experimenting with coca and coca wines, eventually creating his own version of Vin Mariani, containing kola nut and damiana, which he called Pemberton's French Wine Coca. According to Coca-Cola historian, Phil Mooney, Pemberton's world-famous soda was "created in Columbus, Georgia and carried to Atlanta". With public concern about the drug addiction, depression, and alcoholism among war veterans, and "neurasthenia", as well as among "highly-strung" Southern women, Pemberton's medicine was advertised as particularly beneficial for "ladies, and all those whose sedentary employment causes nervous prostration". In 1886, when Atlanta and Fulton County enacted temperance legislation, Pemberton found himself forced to produce a non-alcoholic alternative to his French Wine Coca. Pemberton relied on Atlanta drugstore owner-proprietor Willis E. Venable to test, and help him perfect, the recipe for the beverage, which he formulated by trial and error. With Venable's assistance, Pemberton worked out a set of directions for its preparation that eventually included blending the base syrup with carbonated water by accident when trying to make another glass. Pemberton decided then to sell it as a fountain drink rather than a medicine. Frank Mason Robinson came up with the name "Coca-Cola" for the alliterative sound, which was popular among other wine medicines of the time. 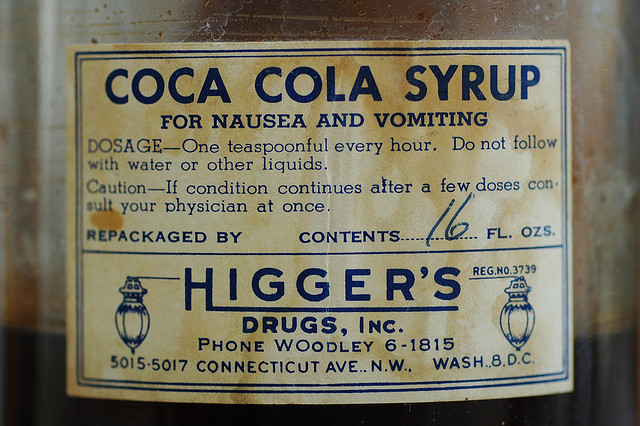 Although the name quite clearly refers to the two main ingredients, the controversy over its cocaine content would later prompt The Coca-Cola Company to state that the name was "meaningless but fanciful". Robinson also hand wrote the Spencerian script on the bottles and ads. Pemberton made many health claims for his product, touting it as a "valuable brain tonic" that would cure headaches, relieve exhaustion and calm nerves, and marketed it as "delicious, refreshing, pure joy, exhilarating", and "invigorating".